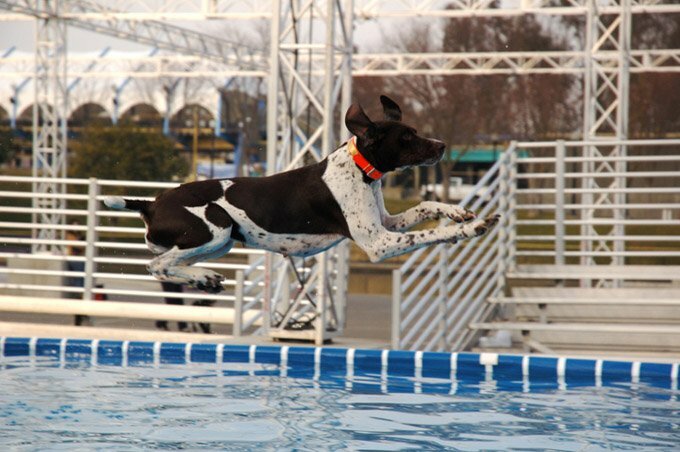 You may have already seen videos of dock jumping for dogs and wondered about this aquatic canine sport. It sometimes airs on TV around the same time as other dog shows. It’s also a very popular pet-oriented summer sport. Dock jumping, also known as dock diving, is a sporting competition in which dogs compete at either distance or height jumping from a raised platform, usually known as a dock, into water. The sport first appeared in 1997 at the Incredible Dog Challenge, sponsored and produced by Purina. Over the years, the sport spread to other countries such as the United Kingdon, Australia, Germany, and Austria. Now, dock jumping has world championships that take place annually. It sounds simple enough on the surface, but dock jumping actually includes three primary disciplines. The first is Big Air, followed by Extreme Vertical, and Speed Retrieve. Each of these disciplines rates dogs based on varying rule sets and ranks them in accordance with their accomplishments. Here’s what you should know about dock diving for dogs. Big Air is essentially long jumping for dogs. Dogs taking a running jump from a 40-foot long dock, usually chasing a toy thrown by their handler or owner. Once the dog makes their leap, the distance is then judged from the end of the dock to the set of the tail when the dog breaks the surface of the water. Jumps are evaluated electronically using digital video and stop action technology. This is the original–as well as the most popular–competitive component of Dock Jumping, and victory is earned by the dog that leaps the farthest from the edge of the dock. Like Big Air, the purpose of this competition is also all in the name. This is a timed event, meaning that the dog must beat a set time in order to win. A suspended bumper toy is usually placed about two feet up at the end of a long pool. The competing dog is placed 20 feet away at a starting line that is usually marked on the dock. An indicator light will change from red to green which will tell the handler to then release the dog. The dog will be timed from the point of release to the point of pulling the toy down from the bracket, which will be at the end of the aforementioned pool (40 feet). Speed Retrieve is the newest form of dock jumping competitions and was introduced in 2008. The dog that gets their object the fastest is the winner. You’re probably starting to catch on with what each of these competitions is ranking dogs on, but just in case you’re finding some gray area, Extreme Vertical is high jumping, as opposed to the Big Air competitive long jumping. Like Speed Retrieve, the competing dog will start at a 20-foot marker on the dock. When the signal to go is sounded, dogs take a running leap to grab a bumper toy held out eight feet over a pool or body of water. The dog must leap to catch the toy in order to succeed. This competition increases in difficulty over time as the dog participates, starting at a height of 4′ 6″ and going up at increments of two inches as the competition progresses. This competition was launched in 2005 and is the second form of official competition for dock jumping. The dog that jumps the highest will take home the prize. If you think these look like fun activities you and your canine might enjoy, you’re in luck! Dock Dogs is a growing club around the United States that is helping dog owners get started in this fun sport. You can visit the list of their clubs here, or search online for other organizations affiliated with training dogs for this sport. While many official dog diving sites say that you can get your dog started in this by yourself, I would advise that you do not go too far without the oversight of a professional or consulting your vet beforehand. Unwittingly subjecting your dog to stress or physical activity could result in serious injury to you or your pets, and believe it or not, not all dogs are excited to get into the water. So be a responsible pet parent and find a certified trainer, or, at the very least, consult a vet before moving forward. Does your dog enjoy jumping into water? Would you consider dock jumping to give them exercise? Let us know in the comments below!